Throwing Stones is a complete roleplaying system. Each stone represents a character type and has six of the skills and effects associated with that character type. When you attempt an action, you throw your stones and count up the faces that are relevant (Dexterity to pick a lock, for expample). The stones are printed in one of three colours Ruby, gold or Silver corresponding to Sterength, Intelligence and Agility. The colour of the face modifies the skill throw total when it is relevant (agility - silver for lockpicking, for expample). When you attack or defend, you count swords and add silver-agility faces. Special attack effects (such as knockdown or poison) happen when you attack successfully. 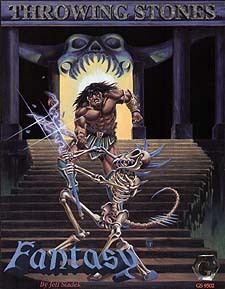 * Complete RPG scenario "Reaper Keep"
* Solitaire adventure "The Trojan Pig"